So what is it like to cross from Poland into Belarus? 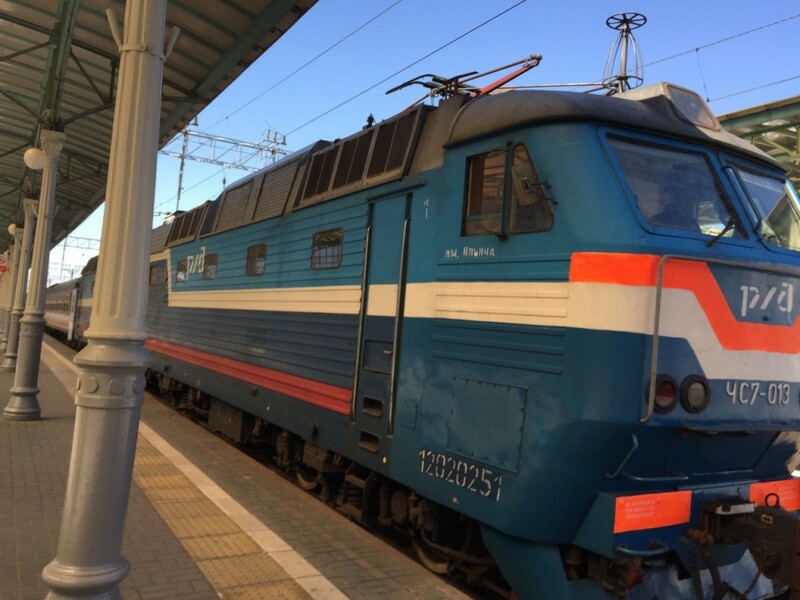 Our train reached the border with Belarus around seven pm. The first group to board were dressed in Polish military uniforms. They asked where were going and why we were on the train, looked at our visas, smiled, and wished us well. I breathed a sigh of relief, thinking that this obstacle of getting into one of the world’s most inhospitable countries was overcome. The train crept along for about 15 minutes when I looked out and spotted a guard post. In five minutes the train had stopped again, and a different military group boarded the train. They did not look happy.The conductor told us we were in Brest, which is in Belarus. We had our door open, and suddenly someone slammed it shut. We waited patiently for several minutes until two officers in brown uniforms abruptly opened our door and demanded our passports, then started searching our tiny compartment. Oddly they did not open our luggage but looked under our mattresses. I was secretly hoping they might find my missing cell phone, the one stolen by the two-year-old in Brittany. They asked essentially the same questions as the other soldiers, gave us stern looks, some forms to fill out, took the passports and disappeared. In about 30 minutes they returned with the passports, frowned and nodded that everything was in order. We had cleared Belarus passport control. How sweet these small victories! Then came the onslaught. The onslaught consisted of three different women—all in their 20s or 30s and pretty, who appeared one after the other, selling exactly the same food—beer, Russian vodka, warm, baked chicken wrapped in newspaper, potatoes wrapped in thin plastic wrap and large pickles. We ended up buying chicken, potatoes, pickles and beer from the first two women. When the third one appeared about five minutes later, we had already purchased all the food we wanted and were low on money. So we refused. But she would not leave us alone, badgering us for a good five minutes before she finally admitted defeat and left. We locked the door behind her. It reminded me of being in Egypt. Part of the challenge was that they spoke no English and for whatever reason demanded to be paid only in euros, which I had already cashed in for rubles at the train station. When it became apparent that we had no euros, they reluctantly agreed to take the equivalent of five euros, which they said was 3,000 rubbles. I had no idea of what the exchange rate was and cheerfully handed over 3,000 rubles as requested, discovering afterwards that the exchange rate is 55 rubbles per dollar, which meant we had paid $60.00. Nice windfall for the ladies. The food, however, was delicious, probably even worth the money when you consider there was no café car . According to Embry the potatoes were the best she had ever eaten and in my opinion the chicken was not far behind. After the conductor chased the ladies off the train, it moved very slowly into what appeared to be some kind of repair facility where we sat for a while with intermittent slams and jerks. And then we sat and sat and sat. By 9:45 pm we were rolling again, a delay of about three hours. As we pulled out of the repair facility–or whatever it was– a huge, orange full moon rose over the mostly dark buildings in Brest. Welcome to the Russian Federation! Onward Toward Moscow! The night went much better than expected and we both got a fairly decent sleep, waking up around six to sun shining through the mist and sparkling, delicate green leaves just popping out in early spring. The houses now were wooden, many in disrepair, resembling the shacks you used to see along railroad tracks in the US and still exist in parts of Appalachia. There were lots of small vegetable plots but no visible cultivation of large fields like we had seen in Western Europe, some early signs that Russia was going to be very different. Just a word to tell you hello and thanks for the precious news. At the very moment you left, dayly “business”came back on me as quick as l had forgotten it and l discovered my pocket phone didn’t work. Next day, it went by the window while l was shaking off the crums of bred ! And the family turned up, Barth first, the 3 others after, just for 4 days… But l come back just a few minutes to you. After this unexpected supper at the restaurant Embry suggested after she had a look at it during a walk, l went back on the 1rst of May around it to “count” the people inside.Every place was closed. ( l’ll spy again around). But l could speak to a masked policeman this time, he seemed to have kind eyes and he was alone in front of this door. His answer was simple : “We have to stay without moving during 2 hours and when it is cold and too windy, we are freezing. We are then aloud to put something around the half down part of our face.” l was relieved by this answer! (And he had that they would wear now a new bulletball jacket. More sturdy, more up to date and fashionable to my eyes. My dear Embry and Joe, l miss you now, and when l believe l’m hearing La Flûte enchantée in my head, l see you both, awaken and delighted in this new enough but not beautiful building of Opera Bastille.